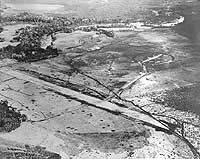 Nevertheless, the U.S. First Marine Division landed on 7 August 1942 to seize a nearly-complete airfield at Guadalcanal's Lunga Point and an anchorage at nearby Tulagi, bounding a picturesque body of water that would soon be named "Iron Bottom Sound". 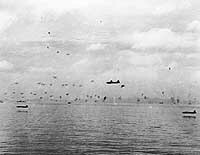 Action ashore went well, and Japan's initial aerial response was costly and unproductive. 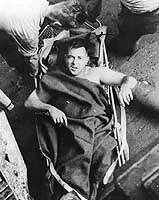 However, only two days after the landings, the U.S. and Australian navies were handed a serious defeat in the Battle of Savo Island. A lengthy struggle followed, with its focus the Lunga Point airfield, renamed Henderson Field. 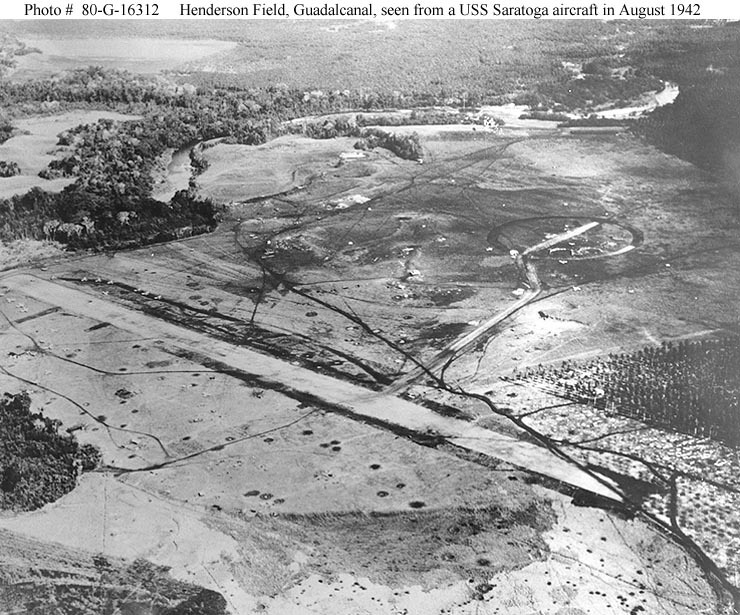 Though regularly bombed and shelled by the enemy, Henderson Field's planes were still able to fly, ensuring that Japanese efforts to build and maintain ground forces on Guadalcanal were prohibitively expensive. 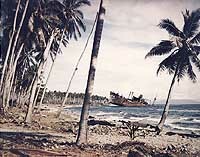 Ashore, there was hard fighting in a miserable climate, with U.S. Marines and Soldiers, aided by local people and a few colonial authorities, demonstrating the fatal weaknesses of Japanese ground combat doctrine when confronted by determined and well-trained opponents who possessed superior firepower. 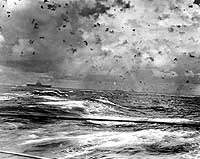 At sea, the campaign featured two major battles between aircraft carriers that were more costly to the Americans than to the Japanese, and many submarine and air-sea actions that gave the Allies an advantage. 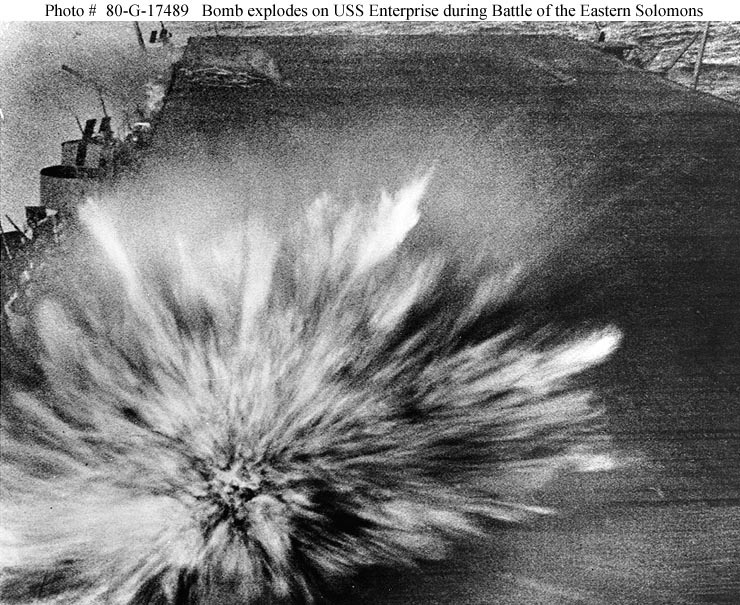 Inside and just outside Iron Bottom Sound, five significant surface battles and several skirmishes convincingly proved just how superior Japan's navy then was in night gunfire and torpedo combat. 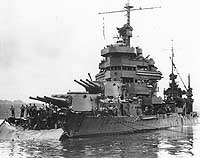 With all this, the campaign's outcome was very much in doubt for nearly four months and was not certain until the Japanese completed a stealthy evacuation of their surviving ground troops in the early hours of 8 February 1943. Guadalcanal was expensive for both sides, though much more so for Japan's soldiers than for U.S. ground forces. The opponents suffered high losses in aircraft and ships, but those of the United States were soon replaced, while those of Japan were not. Strategically, this campaign built a strong foundation on the footing laid a few months earlier in the Battle of Midway, which had brought Japan's Pacific offensive to an abrupt halt. 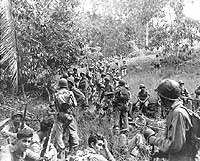 At Guadalcanal, the Japanese were harshly shoved into a long and costly retreat, one that continued virtually unchecked until their August 1945 capitulation. More pictorical coverage on the Guadalcanal Campaign is currently in preparation. A U.S. destroyer steams up what later became known as "Iron Bottom Sound", the body of water between Guadalcanal and Tulagi, during landings on both islands, 7 August 1942. 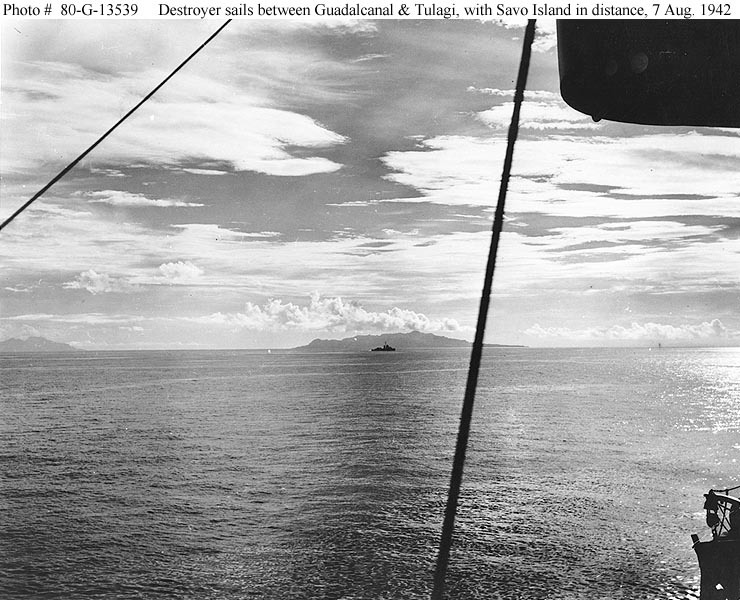 Savo Island is in the center distance and Cape Esperance, on Guadalcanal, is at the left. 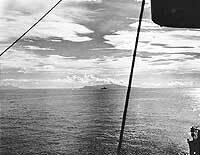 Photographed from USS San Juan (CL-54) from a location approximately due east from the northern tip of Savo Island. 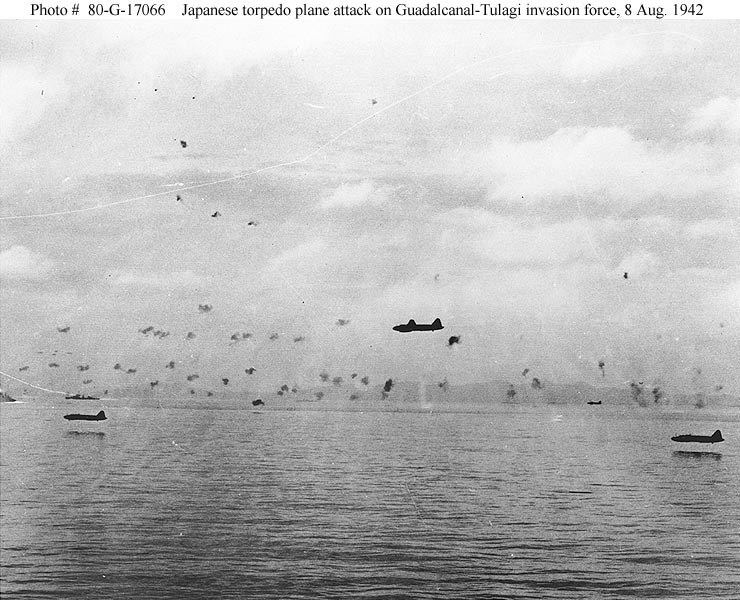 Japanese Navy Type 1 land attack planes (later nicknamed "Betty") fly low through anti-aircraft gunfire during a torpedo attack on U.S. Navy ships maneuvering between Guadalcanal and Tulagi in the morning of 8 August 1942. Note that these planes are being flown without bomb-bay doors. 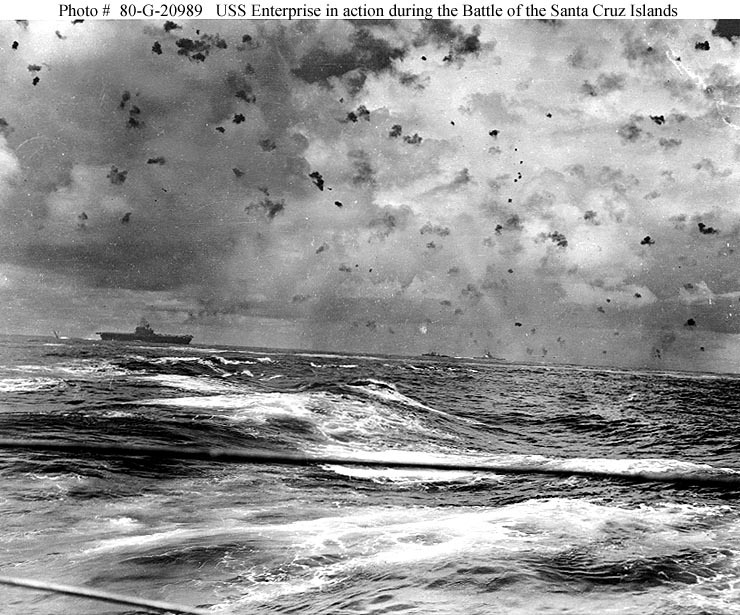 Photographed from a Japanese cruiser during the Battle of Savo Island, off Guadalcanal, 9 August 1942. 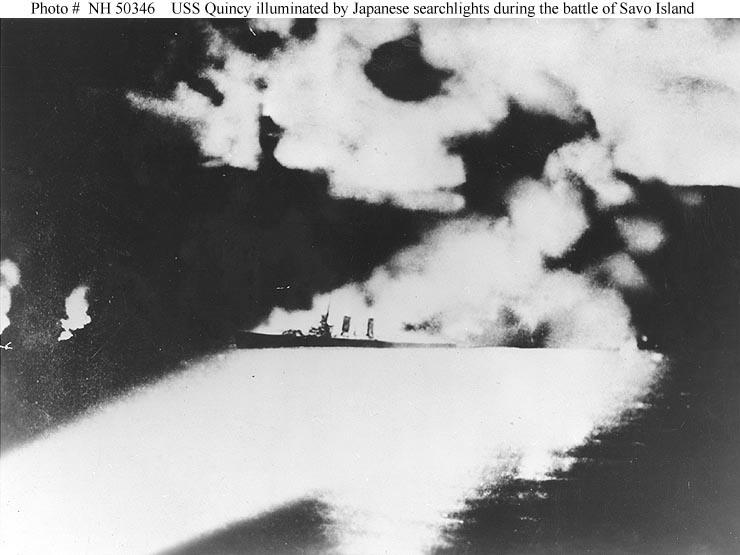 Quincy, seen here burning and illuminated by Japanese searchlights, was sunk in this action. Copied from the Rear Admiral Samuel Eliot Morison World War II history illustrations file. 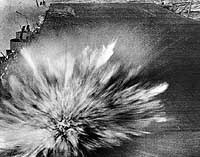 Photographed from a USS Saratoga (CV-3) plane in the latter part of August 1942, after U.S. aircraft had begun to use the airfield. The view looks about northwest, with the Lunga River running across the upper portion of the image. Iron Bottom Sound is just out of view at the top. 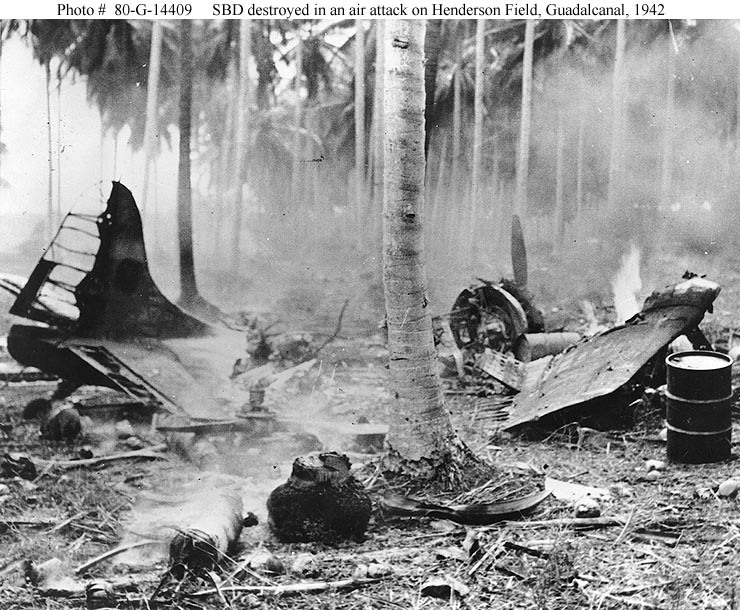 Several planes are parked to the left, and numerous bomb and shell craters are visible. 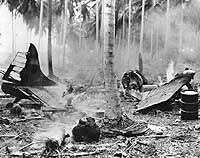 Wreckage of a SBD scout-bomber, still burning after it was destroyed by a Japanese air attack on Henderson Field, Guadalcanal, 1942. 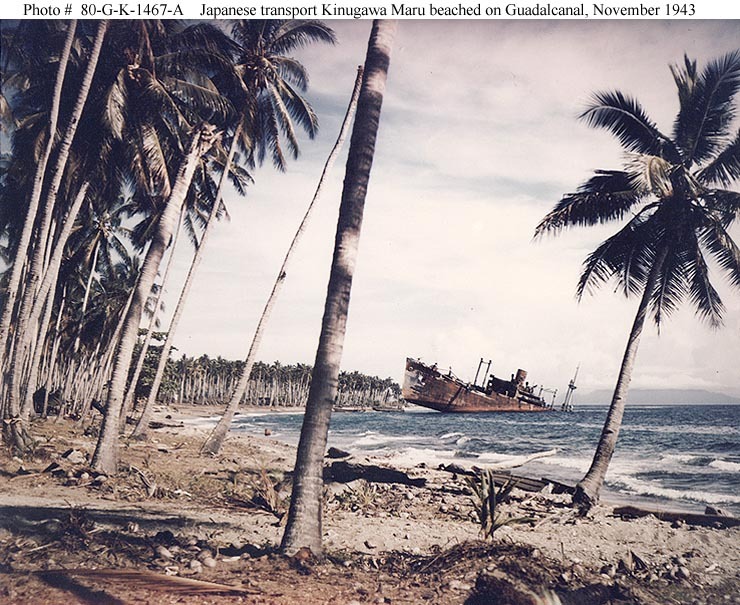 Beached and sunk on the Guadalcanal shore, November 1943. She had been sunk by U.S. aircraft on 15 November 1942, while attempting to deliver men and supplies to Japanese forces holding the northern part of the island. Savo Island is in the distance. 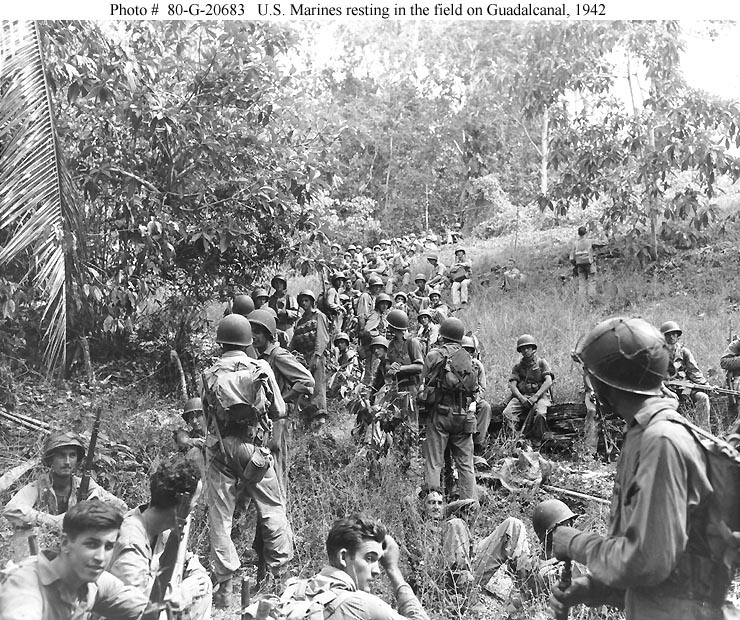 U.S. Marines rest in the field on Guadalcanal, circa August-December 1942. Most of these Marines are armed with M1903 bolt-action rifles and carry M1905 bayonets and USMC 1941 type packs. Two men high on the hill at right wear mortar vests and one in center has a World War I type grenade vest. The Marine seated at far right has a Browning Automatic Rifle. 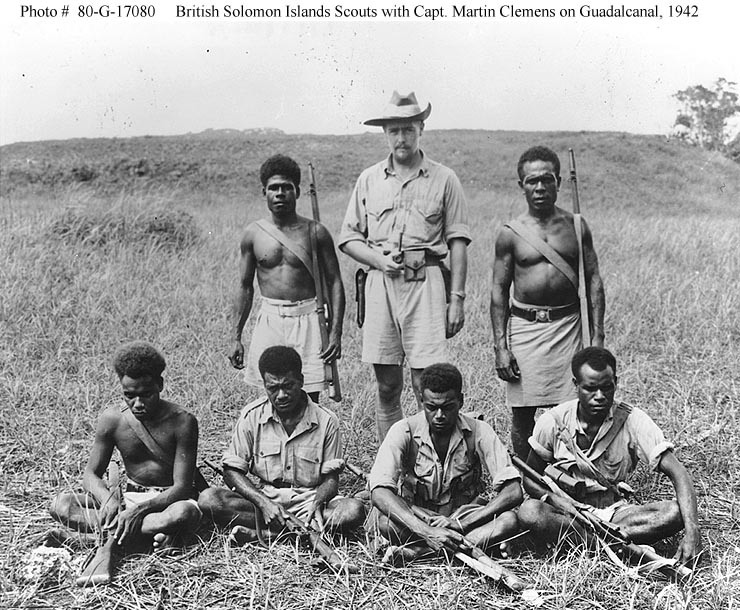 Captain Warren Frederick Martin Clemens, British Solomon Islands Protectorate Defense Force (BSIPDF), with six members of the BSIPDF Scouts, on Guadalcanal circa the later part of 1942. Clemens identifies these men as (standing beside him): Daniel Pule (left) and Andrew Langabaea. Those seated are (left to right): Olorere, Gumu, Chaparuka and Chaku. Each of the Scouts is armed with a British SMLE #1 rifle. 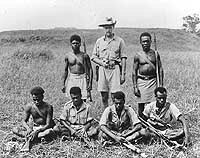 Clemens, the British Colonial Service District Officer on Guadalcanal, had remained on the island throughout its May-August 1942 occupation by the Japanese. USS Minneapolis (CA-36) at Tulagi with torpedo damage received in the battle. Photograph was taken on 1 December 1942, as work began to cut away the wreckage of her bow. An injured man in a stretcher on board USS Minneapolis (CA-36), 1 December 1942, the day after the ship was damaged by torpedoes in the Battle of Tassafaronga.